celery root, then we'll get to the cabbage. This root vegetable is very similar to a potato and therefore can even replace a potato in a lot of recipes. It was time to take this voyage from the farm straight to the kitchen. As a Hanukkah veteran, I was well versed in potato pancake (latke) making and in sticking with a minimalist recipe, I chose to use only 3 main ingredients: celery root, I replaced an onion with a leek, a different member of the Alliaceae family and another cold weather vegetable currently in season and finally 1 egg...easy. Once I removed the dangling roots from the fresh celery root, I then needed to peel off the hard, outer, protective skin, which comes off as easily as any other skinned vegetable. Underneath lies a beautiful naked celery root and if I walked into the kitchen unknowingly, I would have easily assumed it was a potato. After peeling, you want to shred both the celery root and the leek. Add one scrambled egg to the bowl. Add oil to a skillet on medium, preferably with a high smoking point to avoid burning (or don't and piss off everyone in your apartment because it smells like burnt oil). 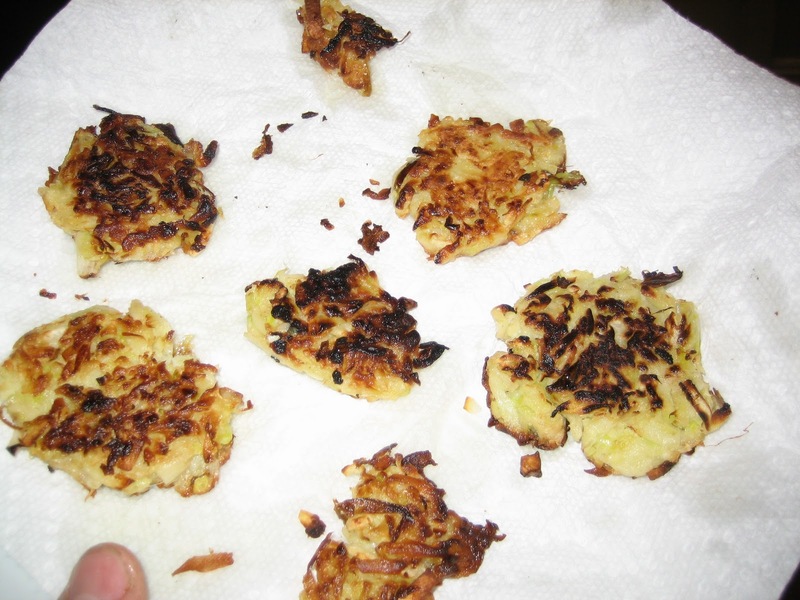 Take a small handful of the celery root, leek, egg and salt mixture and squeeze it in your palm to remove any excess liquid and form a little pancake. Slowly place each pancake onto the pan and flip when brown and relatively solid on one side. Once both sides are cooked to your liking, you are good to go. I felt that these were pretty addicting on their own and had plenty of flavor, but some yogurt, sour cream or apple sauce on the side ain't bad either. The whole process takes a few minutes depending on how well versed you are in shredding and grating vegetables. So what took me a couple of hours in figuring out how to properly use a hand grater and food processor, should in reality only take 20-25 minutes from start to finish. Impress your friends, impress your grandma, enjoy. 1. Remove all dangling roots from celery root, peel and shred. 2. Cut off dark green leek tops and root bottom, leaving only the light green/white center section, shred. 3. Place celery root and leek shreds into a large bowl add the egg and salt; mix thoroughly. 5. Form each pancake in the palm of your hand, squeeze out any excess liquid and place gently in the skillet. Leave until brown or to your liking and flip once waiting for the other side to cook the same. 6. Remove and place on a power towel. Click here to heck out how to use that cabbage in some easy-to-make spicy cole slaw.